Joseph Newton: We're not talking about killing people. Herb's talking about killing me and I'm talking about killing him. Q: What is the tune that Charlie can't get out of her head? Q: Why didn't the police just arrest Charlie? Q: Is it true that Shadow of a Doubt was patterned after Dracula? With the rousing score of Dimitri Tiomkin and the wonderful camera work, this captivates from the very beginning. We switch from the tight, small lodging out into wide open and view a chase on foot from above, runners and shadows racing before us as we wonder just what is afoot. 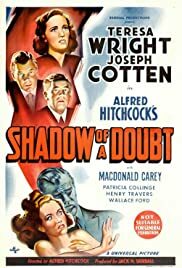 As it happens we are to find out that Joseph Cotton's character is guilty almost straight away yet spend the rest of the film in suspense as we doubt ourselves. 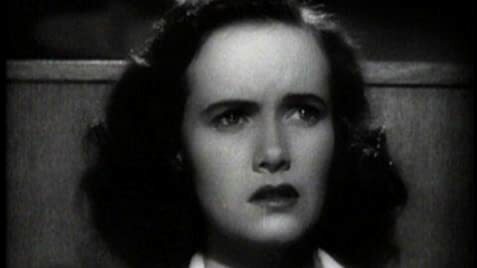 This partly because of the tale of his personal history and partly because of the love and affection of his niece, a wonderful performance from Teresa Wright. Shot largely on location and using a lovely old property in which the large family tumble this way and that in marvellous abandon while the lady of the house tries to maintain control. I learn from the extras that in the end, more shots were required by Hitch and so a set had to be built anyway replicating the building. A very fine, involving, moving and suspenseful film.